George Graham Reviews the Ernest Goodlife Band's "Good to Be Here"
For most of the history of rock and roll, there have been a couple of undercurrents to the music, both of which have to do with the its origin in youth. First for the music to be properly claimed by a generation, it's important that it annoy their parents. Rock and roll was born of teenage rebelliousness, and each generation needs to have music they call their own, from punk rock, to electronic dance music, to hip hop. And another part of that is a bit of angst. In the flower of youth, young audiences seem to need something to get depressed about. From the car crash songs of the 1950s to the gloomy side of the psychedelic scene to groups like Nirvana. This week, we have a young band that almost exactly the opposite of all of that -- they create sunny, infectious music that their parents would probably very much approve of. 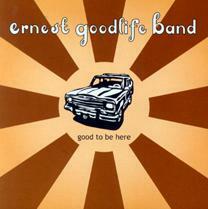 The group has an appropriate name, the Ernest Goodlife Band, and their CD is called Good to Be Here. The band was founded by Mark DeRose, a York, PA, native, who assembled the group while living in Boston, which is where the recording was made in 2004. It is just now being distributed on a record label. DeRose cites as some of the band's main influences James Taylor and the Allman Brothers Band. But one can hear some of the early Doobie Brothers, and perhaps some of the folky upbeat groups of that period like Poco. He also names the Dave Matthews Band's Under the Table and Dreaming album as the one that inspired him to make music as a career. The group, by the way, got its name after a fan saw DeRose performing with an early version of the ensemble, and commented on how "earnest" the band's music was. The Ernest Goodlife Band's sound is marked by an endearing quality with pleasing vocal harmonies, plenty of acoustic guitars, and tuneful melodies. And the lyrics are generally positive, but the group manages to avoid being lightweight or too sweet. They also borrow some of the qualities of artists who influenced them, along with the Beatles, in making appealing music that's also interesting and has some musical depth. The other members of the band on the CD include drummer Mikey Lawrence, lead guitarist BJ Block, and bassist Shannon Chwialkowski. All are tasteful players, and each makes a notable contribution to the sound of the CD. Despite their appealing qualities, DeRose's songs tend to avoid pop music cliches. Some are surprisingly philosophical, and one takes up the subject of a presumably illegal immigrant facing deportation. But the general lyrical mood is, by and large, as positive as the sound of the music. The songs tend to be short and sweet, as is the whole CD, clocking in at under 40 minutes. This is definitely not a jam band, at least on this CD. People of a certain age are fond of saying "They don't make music like they used to." But the Ernest Goodlife Band is another example of the fact that there are a good number of young groups who do make music with the attractive pop quality and intelligent lyrics that sprang from the Beatles and the 1960s folk scene. And this group is one of the best of the current crop, with very good songwriting, pleasing vocals, and a ringing acoustic-guitar laden sound. Their CD Good to Be Here is a fine release in virtually every respect, with every song having something worthwhile to offer. Sonically, we'll give the recording about an "A-Minus." Some of the acoustic instruments are handled better than others, but the vocals are cleanly recorded, and overall the sound is as bright sound as the music implies. The dynamic range, how well the music spans from loud to soft, could be a bit more consistent, but it's above the contemporary average for rock CDs. This CD started out as a very independent release, with a page of thank-yous in the booklet to all the people who paid for the CD in advance, which helped to finance the recording. Since then, Good to Be Here has been released by a Philadelphia-based record label. The band itself moved from Boston to Philadelphia, or at least half of it did. Principal songwriter and lead vocalist Mark DeRose and drummer Mikey Lawrence did. They now have a different lead guitarist and bassist, so the band may have a somewhat different sound. Nevertheless this two-year-old recording, now just being made available nationally, has a great timeless quality that neatly defies all the stereotypes of disposable, trendy pop.